‘Central to my work is the transformation of the global landscape under the weight of industrialization and myth of progress. It addresses the residual of consumption, the mutability of history and the material inequalities of a world reduced to a bottom line. Having spent the last decade documenting landfills, industrial refineries and other scarred landscapes, my work in New Zealand has been concerned with the deforestation and mining of the Coromandel peninsula by multinationals from overseas. Sustainable development is defined as “that which meets the needs of the present without compromising the ability of future generations to meet their own needs” (World Commission on Environment and Development, 1987). Yet sustainability shatters under the weight of short-sighted industrial expansion. A direct threat to sacred landscapes, natural landmarks and topography, the environmental impacts of mining and deforestation are both large-scale and permanent. The insistence that the technologies in place ensure environmentally friendly practices fails to account for the deposition and leaching of toxic chemical that contaminate local water supplies and disrupt the entire ecosystem. The impoverishment of soil, reduction of biodiversity and degradation of water and air, are all symptoms of corporate carelessness. During her time at Earthskin, Sam Heydt will also be part of the ‘Fun Palace project’ in Muriwai, with Carly Mann. 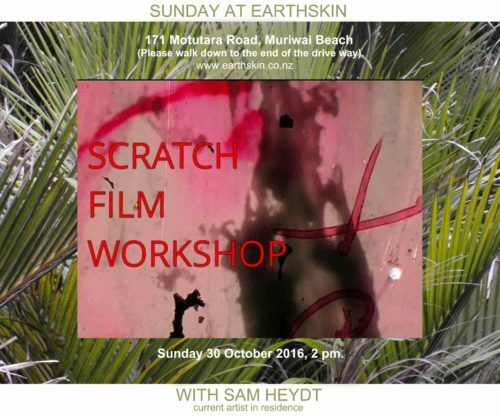 Sam Heydt (new media & social practice artist – United States) will be giving a Scratch Film workshop open to all ages the last Sunday of the month. For those who missed Fun Palace or whose curiosity was peaked while at the event, this is your chance to learn more about the process, technique and history behind the medium and create a collaborative film with your peers. The workshop will be held at Earthskin (171 Motutara Road, Muriwai Beach) on Sunday October 30th 2016 at 2pm. Please walk down to the end of the drive way (exception can be made if required). Carly Mann is a mixed media artist from England. ‘In early 2016 I will be embarking on a personal journey to New Zealand, which really is the other side of world for me, living in the UK. During my year in New Zealand, whilst my senses will no doubt be on overdrive, I wish to create a connection with this beautiful country that I have waited so long to experience. It will bring intensive engagement with the natural world. The artist residency will provide a chance to immerse my self in the beautiful natural surroundings that I will feed from to produce a series of work to exhibit. The whole landscape will be different from home, but I am certain I will draw connections and contrasts to my usual habitat, and I’m interested in how these can both be explored together in the work. During her time at Earthskin, she will be part of the ‘Fun Palace project’ in Muriwai. 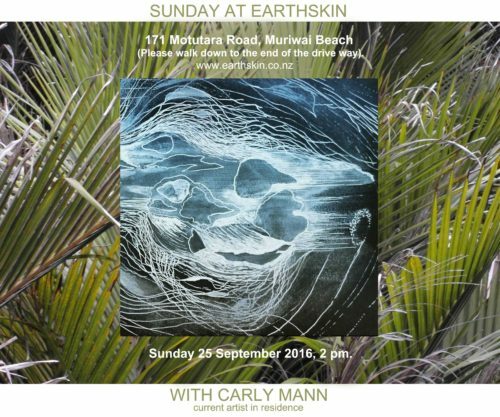 Carly Mann (mixed media artist – England) will be sharing an exhibition of her work completed during the residency as well as artworks created on her journey through New Zealand. Come and join her for an informal gathering discussing the inspiration behind the pieces and thoughts regarding the ever-changing media to express these ideas. It will be held at Earthskin (171 Motutara Road, Muriwai Beach) on Sunday 25 September 2016, 2 pm. Please walk down to the end of the drive way (exception can be made if required). Eunjung Hwang received her MFA in Computer Arts at the School of Visual Arts, New York. Her animations and character based art works has been featured and awarded in International Short Film Festival Oberhausen(Germany), TRANSMEDIALE(germany) and Drawing Center(USA) among others. Through the Creative Artist Residency program at Earthskin Muriwai, I’d like to work on a series of character-based animations and related works. 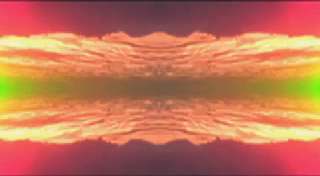 The project will explore the complexity of cryptic images from the world of dreams and the subconscious. While the project will share my continuous interest in character-based art works and visionary narratives, it will focus on the various influences from the local of Earthskin Muriwai /New Zealand. The physical and cultural background will be broadly researched for the inspiration. A variety of unique characters that are mainly inspired from the local will be the main elements of my project. Eunjung Hwang (Computer Artist – Korean born, living in the USA) will share her character-based works including animations and the work in progress project at Earthskin. Casual talk and conversations about the works will be followed. 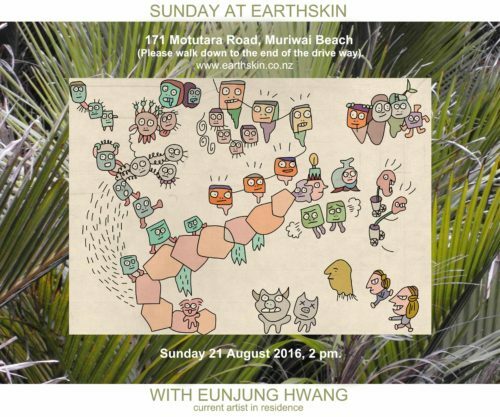 It will be held at Earthskin (171 Motutara Road, Muriwai Beach) on Sunday 21 August 2016, 2 pm. Please walk down to the end of the drive way (exception can be made if required). Born in Hong Kong in 1981, Thomas C. Chung is an Australian artist, based in Sydney and Scandinavia. His area of practice is: Visual arts; Painting, Drawing, Sculpture & Installation. His interest for Earthskin Muriwai is a project which involves the creation of new artworks using craft-based techniques. The concept will be an exploration of traditionally craft-like materials, pushing the boundaries of what one considers to be contemporary art. His three-dimensional artworks are soft, knitted and crocheted sculptures of food, toys and flowers which are made from yarn and acrylic stuffing. The pieces are often hung as both free-form and framed artworks. This new body of work will consist of a botanical theme of plants and flowers. Created alongside this will be two-dimensional drawings on paper envelopes, speaking of a personal narrative from recent travels. You’re kindly invited to meet our current artist-in-residence, Australian artist Thomas C. Chung. Having spent the last decade creating, travelling the world, this will be a friendly gathering of creatives & curious souls. Do join us (don’t be shy) & please come have a chat! It will be held at Earthskin (171 Motutara Road, Muriwai Beach) on Sunday 24 July 2016, 2 pm. Please walk down to the end of the drive way (exception can be made if required). Kazuko Kizawa is a visual artist from Japan, living in Finland. She works in a variety of media such as installation, video, photo, painting and 3D. The pursuit of the possibilities of colour and light has been her consistent theme in her work. During her residency she hopes to pursue her theme of colour-light. She would like to create new work that combines the themes of her work with site specific elements of Muriwai wilderness. While thinking about the style of her work, she recently deliberately included geometric patterns. She realized that ancient geometric patterns exist in all parts of the world. She wonder whether there is a divine, or mythical element behind geometric patterns. As the same can be said about Maori patterns, she would like to do research and create new art works in Muriwai, a place where Maori culture still remains. 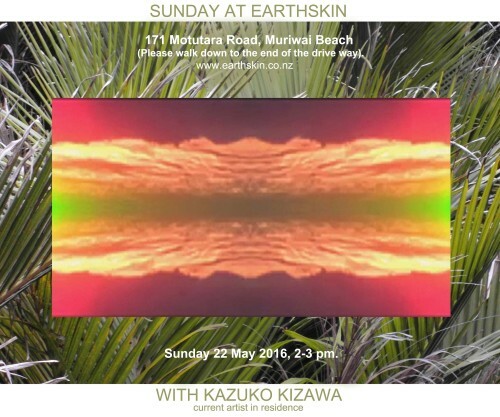 SUNDAY AT EARTHSKIN / 22 May 2016. Kazuko Kizawa is a visual artist from Japan, living in Finland. 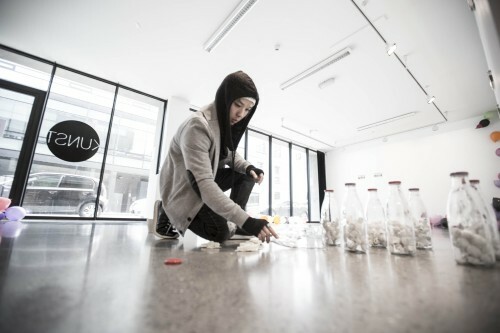 She works in a variety of media such as installation, video, photo, painting and 3D. She participated in her first residency at the Banff Centre in Canada in 2002. It was a tremendously influential experience for her. Since then she has attended numerous artist-in-residence across the world. She has enjoyed the way that her work absorbs and is changed by the landscapes, materials, and people that she encounter along the way. She think that working in residence is the most effective method for her. She will talk about her works during attending some residencies and each Residency’s facilities. It will be held at Earthskin (171 Motutara Road, Muriwai Beach) on Sunday 22 May 2016, 2 – 3 pm. Please walk down to the end of the drive way (exception can be made if required). Gabriele Beyer is a fabric designer and a hand painted silk artist German born, living in the USA. Although not conventionally representational her work has always been influenced by her physical environment. For her travel and art are inseparable. The natural world, shaped by her inner perceptions, takes on a mystical and magical quality. Without nature she could not create. From Newfoundland to Alaska, place and inner vision have always worked together. From this extraordinary experience at Earthskin, she is longing for a repeat of meeting another community far away and going to a place of nature. She designs a new collection of neckties and scarves every year and draw her inspiration from nature. In Muriwai she is seeking a new fauna and flora to stay fresh in her design work. Diane Goettlicher is a metal artist, painter and lazure artist from USA. She is a person who believes that beauty is one of the most important aspects of life. Whether it’s the way in which you arrange the dinner table, the colors you chose to wear, the knick knacks that you collect, the way you walk down the street, the way that you notice the clouds running across the sky . . . . . to the way you write, the way you paint, the way you live. She also enjoy movement . . . . . the big movements of painting on walls as well as the big movements of traveling, whether it be far away or to the river at the end of my street. Gabriele Beyer (fabric designer and a hand painted silk artist – German born, living in the USA) is going to share her silk work (scarves, neckties and bow ties) and will also show her drawings and paintings she finished during her residency at Earthskin Muriwai. She will talk about how valuable this creative residency is to her in regards to the challenging process of designing her new ART to WEAR collection and provide an inside into her design and production process. During her stay at Earthskin, Diane Goettlicher (metal artist, painter and lazure artist from USA) found both beauty and movement in her daily life. One only needs to glance around the property to witness the beauty. Daily walks through the bush to the beach provided the movement that inspire the choice to create. 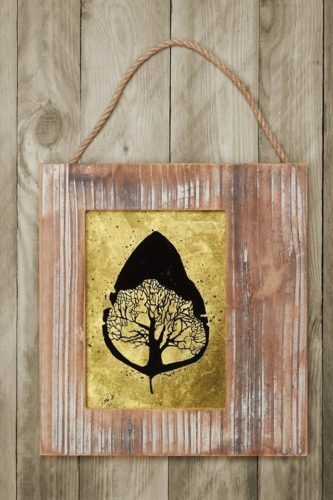 Printmaking became the medium……objects from nature; pods, ferns, seeds and leaves became the “brush” with which to paint. Her exploration included not only the tools from nature, but also many different types of paper and collage techniques. The real play was what she calls “mark making”—-how can all these various elements make their imprint? Come see………! 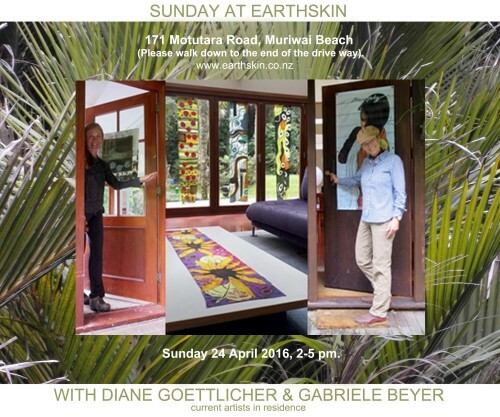 It will be held at Earthskin (171 Motutara Road, Muriwai Beach) on Sunday 24 April 2016, 2 – 5 pm. Please walk down to the end of the drive way (exception can be made if required). 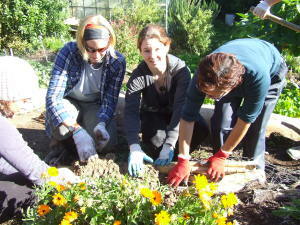 EARTHSKIN CREATIVE & ENVIRONMENTAL RESIDENCIES Welcome to Sara Fruner, Arwen Flowers and Elisa Novick. Elisa Novick is an healer, counselor, workshop facilitator, Lightworker, writer and tree lover from USA. During her Earthskin Environmental Residency she will write her first book about the amazing experiences she has had communicating and partnering with sentient trees whose work is at the highest spiritual levels and who are collaborating to save and thrive life on earth. Arwen Flowers is an artist, graphic designer and photographer from New Zealand. For her one month Earthskin Creative Residency she would like to utilise her graphic design and artist skills through using photography, collected images, mob apps, graphics and art mediums to create handmade artwork and a range of posters for print and social media, as they are well received form of modern communication which can be both creative and informative. While keeping New Zealand native life in the foreground, her objective is to explore ideas around collecting and cataloging as a way of promoting species preservation, and the relationship those practices have with supporting a biodiverse, sustainable future. During this residency she think of the information gathered from collecting and cataloging as a kind of bridge that leads to discernment. Knowledge creates the potential for wise decisions. Arwen Flowers (artist, graphic designer and photographer from New Zealand) will talk about the photographic and printing processes involved in making her work. She will offer several pieces for in-depth discussion as well as presenting a small exhibition of completed pieces. There will also be a little gentle participation experience, to engage us in considering the act of collecting as a thoughtful process that meets our need for connection with the environment while promoting care for the natural world. 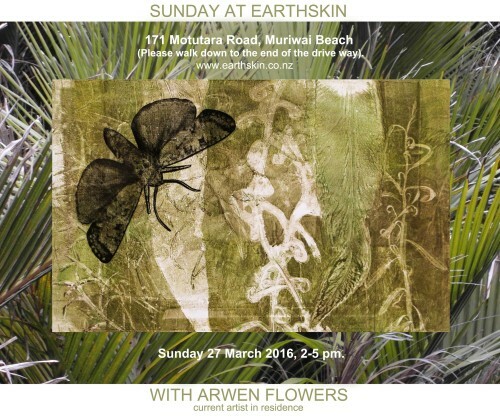 It will be held at Earthskin (171 Motutara Road, Muriwai Beach) on Sunday 27 March 2016, 2 – 5 pm. Please walk down to the end of the drive way (exception can be made if required). Sara Fruner is a writer (fiction and poetry) from Italy. Going on with her second novel, A Shadow Hovers Then Upon Us. It focuses on the downfall of a couple after getting married and having a baby. It aims at voicing out the obscure unsaid thoughts a wife and a husband cherish in their soul and cannot possibly confess as a man and a woman living in a value-driven society where what they should do often clashes against what they want to do… To an unexpected ending. Assembling texts for her second volume of poetry, The Key in the Bunch/La chiave nel mazzo. My talk will be a conversation on my personal journey as a poet who first fought back, slowly surrendered to, then welcomed and in the end fell for poetry hard. It will be a praise on my mentors and masters. A confession on how the creation process works for me. From these personal considerations, I will move on to Lucciole/Fireflies my first collection of poems ― to be published at the end of the year. I plan to read a selection of texts which best capture the places I like to explore through language. I plan to read my poems both in Italian and English, so that people will have the chance to experience two different kinds of music. Caught between opposites, Lucciole/Fireflies is a collection of bits of light and dark. Fireflies are little creatures living deep in the heart of the night, yet they are made of light: and the blacker the night, the shinier they shine. Fireflies are an interesting objective correlative for human beings, their fragility ―“siamo lucciole in palmo alla notte/we are fireflies in the palm of the night” reads a line in the eponymous poem “Fireflies” ― their condition of being always surrounded by darkness, by unknown hunting/dangers or creepy presences/animals. And yet they hold and carry a message of light, as well as the possibility of love, passion, beauty and hope. These are topics, which inform my poetry, together with pain, wonder, mourning, loss, the quest for beauty in an ethical and environmental lacerated world. I would love the conversation to be a mutual exchange, to have people interact with me not just on poetry, but also on art in general, and to listen to how they relate to the different artistic expressions they are keen on, or have the chance to experience locally, such as cinema, theatre, visual arts, music, etc. 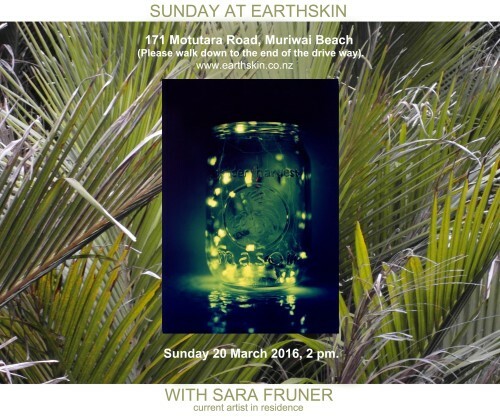 It will be held at Earthskin (171 Motutara Road, Muriwai Beach) on Sunday 20 March 2016, 2 pm. Please walk down to the end of the drive way (exception can be made if required). Yim Sui-Fong is a research based artist from Hong Kong. She is coming in Residency at Earthskin to develop the photography and writing project topic about human and land – tentative titled, Breathing Thought. Her work frequently depicts human vulnerability, which takes its point of departure from the ongoing negotiation of emotion memory on relation between human, and human with everyday objects. She works across the mediums of installation, photography, video and writing. The documentation of the action often includes panels of text of her own writing. She was an editor for Independent Critic in Beijing, education officer at The Library by soundpocket in Hong Kong. She is a co-founder of Rooftop Institute, a new established artist-run organization with mission to develop artist programme to foster greater awareness of issues related to art and society in Asia Pacific. Through her Earthskin residency she would also like to establish networks between artists and communities in New Zealand. Everyone is welcome to join our monthly Sunday at Earthskin, Feb 28 from 2-5pm. 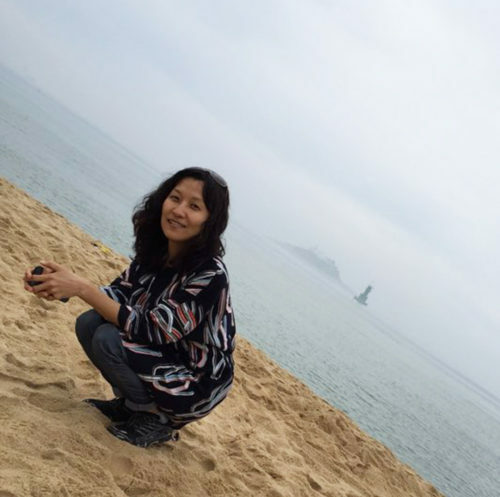 Yim Sui-fong will share her projects and research on socially engaged art, as well as the new finding in Muriwai residency. Earthskin Residents will be offering free community talks or workshops on last Sunday of most months. 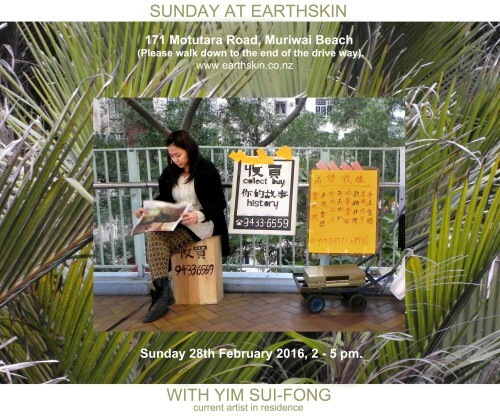 The last sunday of February, artist Yim Sui-fong from Hong Kong will share her projects and research on socially engaged art in Hong Kong and Beijing, as well as her new work, H­H, in Earthskin Creative Residency. It is about navigation and journey, reality and myth, quotidian and art. 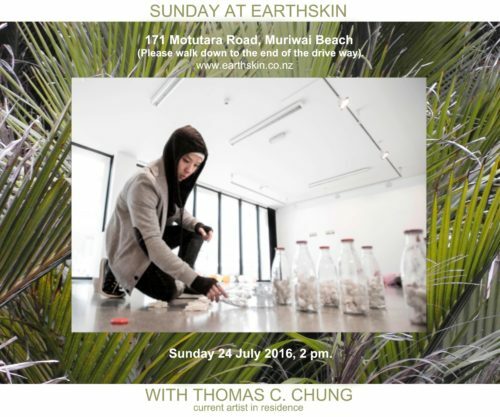 It will be held at Earthskin (171 Motutara Road, Muriwai Beach) on Sunday 28 February 2016, 2 – 5 pm. Please walk down to the end of the drive way (exception can be made if required). Here is the list of our successful applicants: Barbara Bodnar, Joshua, Braden, Jenny Drummond, Bec Norris. 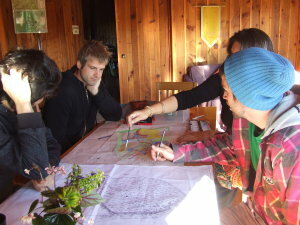 We wish everyone well for the upcoming Permaculture Design Course at Te Moata Retreat Centre, 28 May – 10 June 2016. NEWSLETTER OF THIS 2016 YEAR. We are most honoured to have such an exciting cast of Residential artists waiting in readiness for their time to unfold into community, and within the sanctuary of Earthskin Muriwai. Below are the current years residencies for you to look at. This year for Earthskin two changes will encourage broader participation in community. Firstly, our artists in residence will have an opportunity to talk about their work and share their creative exploration within our local Waimauku School. And secondly, the addition of the Earthskin Environmental Residency will give people bringing about environmental sustainability and social justice, the space and time to retreat into the offered quiet, so they can focus on their commitment to our small planet. Dont forget to mark your calendar for the current artists presentation.